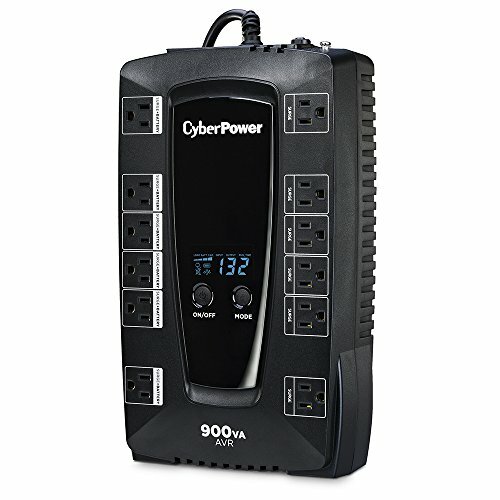 The Cyber Power Intelligent LCD Series AVRG900LCD uninterruptible power supply (UPS) safeguards PCs and other electronics (monitors, cable/DSL modems, VoIP routers, and home theater devices) from blackouts, brownouts, surges, spikes, sags, and other power abnormalities. Its Automatic Voltage Regulation (AVR) boost/buck technology delivers a consistent and clean AC power, protecting connected equipment and preventing costly business interruptions. Its composite integrated circuitry offers advanced lightning protection. This UPS system is ENERGY STAR qualified with patented Green Power UPS Bypass circuitry to save on energy costs by reducing energy consumption and heat buildup.